All of our giveaways are international. The winner will be notified by e-mail and then has 3 days to respond. My favorite genre is paranormal romance/urban fantasy because of the fantastic world building and intriguing characters. I love the love story in These Fractured Lights by Amie Kaufman and Megan Spooner! I have read Christmas Ever After and the entire story is captivating and I want to read it again! I love The Best of Me by Nicholas Sparks. “She turned to face him. ‘What were we thinking?’ ‘We weren’t,’ he said. ‘We were in love.’” It's so romantic and sad, but hopeful!! Oh that one is so hard. Romantic ones are all I read. Thanks for the giveaway. Happy Valentines to you. I love so many ... but I love it when the characters realize they are in love with the other ... especially if they have been trying hard to deny it! My favorire is Easy by Tammara Webber. I love the swoony romance in it! Gosh, so difficult to pick one but the last one I read was really romantic, Wickham Hall, with him taking her to see the sunrise, painting her a painting and basically being so cute! My favorite has always been Gone With the Wind. Favorite book: Letters from the sea. There are so many stories that I've loved, but I have read Leave Me Breathless by Cherrie Lynn so many times as I adore Macy and Ghost. I have a soft spot for brother's/sister's best friend books! I do love Mansfield Park by Jane Austin - so romantic! Outlander by Diana Gabaldon ! I love that book because it takes me out of my daily life ! When i am reading that book it's like i am living in that book ! Pride and prejudice is a classic! Thenotebook, i like the book and the movie! My favourite romantic book is Jane Eyre.I never tire of it. I love The Fault in our Stars. My fave scene is when Hazel Grace meet Augustus. One of my favourite romantic books was The Notebook. 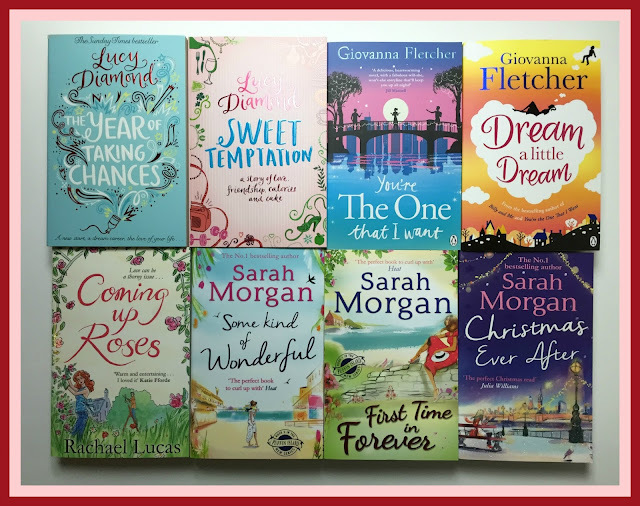 I adore all of Sarah Morgan books, don't think I could choose between any of them! Cheesy, but the first time I really read a romance that I was torn up about was New Moon by Stephanie Meyer. I was moved by the love Jacob had for Bella. But there are so many now, I can't pick my favorite so I went with my first. Thanks for the fun giveaway! I love Jane Austen romances. Sense and Sensibility, Pride and Prejudice...those types of stories. My favorite romance book is the entire Addicted series by Krista & Becca Ritchie, their books are romantic and deal with such important topics! I love the moment in Sense and Sensibility where Elenor realises that Edwards is not married. My favorite Romantic book is A walk to remember !! I love most of the books written by Nicholas Sparks !! Tthe story between Landon and Jamie was so pure !! The writing style was too good too . My favorite romantic book is Gone with the Wind. Well, the first book that pops in my head is Jayne Eyre. I think the whole concept of self-denial is romantic. I think my favorite book is 'The Last Letter From Your Love' because I felt the love between Jennifer and 'B'. That's a difficult question because my favorite books are all romance books. I think any of the books by Eloisa James, Julia Quinn, or Lisa Kleypas. I think the most romantic book is winter soltice by rosamunde pilcher. The scene that always leaves me breathless and with butterflys in my belly is the one in the book Anna and the French Kiss when Anna's going down the stairs, sees St. Clare and realize she oves him and thinks "How could I have ever been so stupid? How could I have ever think I was not in love with my best friend". I know, there's no kissing, but there's something very romantic when you realise you're in love. Ha! I like angst in the books. And I just love it when he presses her against a wall and kisses her pasionately. I love epic romances where the people come over great difficulties and obstacles to be with eachother. One of my favourite romantic books is Anna and the French Kiss. I love romance books so it's hard to pick one but I love the first kiss scene always!!! I've read too many to pick a favorite. From the classics I have to say "Sense and Sensibility" by Jane Austen. From the contemporary novels I really like Nicolas Barreau's and Sarah Morgan's "Sleigh bells in the snow"
I love The Great Gatsby because their love just cannot be and it's so upsetting! I love the classics but my favorite is Little Women. I actually had to give this some thought for several days now, but I simply can't pick a favorite romantic book *sigh* because more often than not it's the small romantic snippets in various genres that win me over and not necessarily a romance novel itself. Persuasion by Jane Austen is my favourite romantic book. My favorite romantic book is Me Before You. I can't decide but I enjoy reading romantic books! Great collection! I think that these books could me my favs if I win! The Infinite Moment of Us by Lauren Myracle. -AngelicaA. Wurthering Heights. It's a little dark but I love it. My favourite book is Twilight. I had been trying to find some common ground with my daughter who had been diagnosed with Asperger's Syndrome. She found it difficult to read a book because she would lose her place on the page. I bought her the first Twilight book and read it with her. I would read a page and then she would, using a small ruler to keep her place. Any words she didn't understand, I would explain and we both became very involved in the series! Quite a few dinners were late! That book kick-started her love of reading and now she is a total bookworm. My favourite romantic scene has got to be the first 10 minutes of up! Not a book, but nothing makes me cry more! My most romantic book is ps I love you. I love the beach scene. Romeo & Juliet at the end.